Dr. Seuss was a man who wrote the stories that most of us remember reading before bed time when we were kids. The man was a legend in the industry for creating this rhyme filled adventures in his wonderful wild land filled with characters such as the Lorax and the Cat in the Hat. One of his most famous books is the timeless classic Green Eggs and Ham. 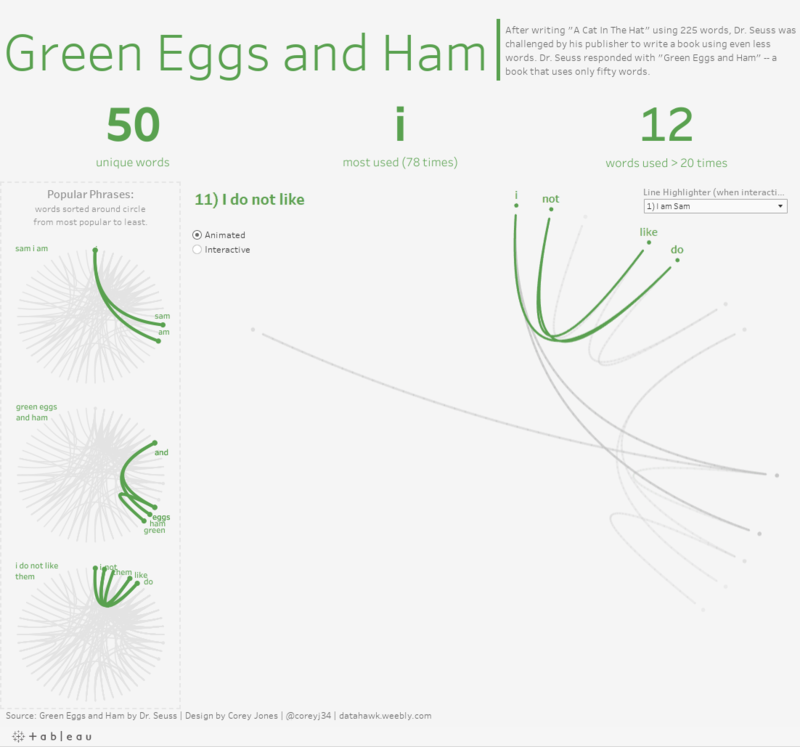 Corey Jones examined just how masterful Dr. Seuss was with his words in this Viz about the number of words used in the classic. + Do you use Tableau Online to share Vizzes? If so, be sure to check out Greg Bennett's post. Get Ready for the Tableau Online Upgrade to 10.5 where Greg covers the new features with 10.5 and what they mean for you. Congratulations to Joe Mako for achieving the "Help One, Help All" badge this week with 100 posts marked "Helpful". In addition Brent Mathison achieved the "Helpful is my middle name" badge. Also achieving the "Questions for Breakfast" badge is Peter Fakan! These contributions of Tableau users is what makes this community great. Thank you for your contributions! The post Nesting IF/CASE question by Brandon Grell was posted on December 14th. Jim Dehner was able to provide an answer that was marked correct after a several comments of assistance were offered from other customers. This week's top voted idea is the Ability to Disable the One-Click Sort idea going back to Valentine's, February 14th, 2014 by Shawn Wallwork. This idea gained 10 new votes this week. Being avid consumers of data science and visualization they seem like a common phrase. But how common are these phrases? Hannah yan han created this visualization looking at Google Trends data and examined how often the terms "Data Visualization" and "Data Science" were searched in major cities across the globe. That is the news for the week! Please send any comments, questions, or concerns to the community team at community@tableau.com.